We generally don’t make any rules for our members when it comes to making the acquaintance of fans from other clubs. This has to be said since there’ve been discussions going on for some time (or say – there have always been discussions on the question, which clubs we want or should spend our time with) to find out, which clubs we „should“ maintain contact with: Mainz, Jena, Barfuß Kairo or none at all („Since we Gladbacher don’t need anyone?!“). There are various opinions in our club too (which is a good thing). Nearly all our fanclub members consider the fanclub of Mainz as their friends, which makes many members attend the matches at the Mainzer Bruchweg – where the stadium of the FSV Mainz 05 is located - or away matches of the 05‘. Like this, good contacts with the fanclub scene of Mainz have been established, and our fanclub has become well-known in that carnival stronghold. Background: It all started in October 1994 when the Mainzer came to Mönchengladbach for the cup match. As the CD from the Mainzer fanclub puts it: „Ten goals, a great atmosphere, lots of singing and friendships in joyful exuberance.“ When Mainz, already desperate, managed to make their first goal after four balls had hit their net and eventually hit back with further three goals, leading to a score of 5 : 4, all two thousand Mainzer fans had a good reason to serenade their team. When the Gladbacher wave also infected the part of the stadium where the Mainzer fans had settled down, a new friendship was born. „Gladbach and the FSV Mainz“ has been a popular song at the Bökelsberg and Bruchweg ever since. Most of the Eifelpower Borussia fans have a positive attitude towards the „Reds“ from Liverpool. That’s why more and more club members have attended the friendship tours to Liverpool that have been organized through our fan project since 1992. The same applies to this year’s friendship tour. Furthermore, our president Johnny, together with some like-minded fans, occasionally goes to the city on the Mersey or to Liverpool’s away matches to support the Scousers. That’s how good contacts with the LFC-fans have been made. 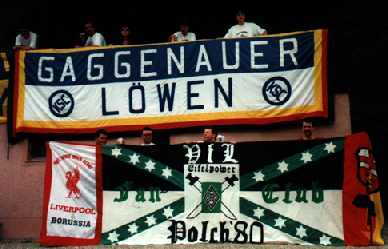 We were even given private accomodations in Liverpool and Birkenhead (across the river), and the LFC supporters have in turn come over here to join our matches (such as the match against Bavaria in 96 / 97, and the one against Cologne in 97 / 98). Moreover, Johnny is a member of the Liverpool FC International Supporters Club. Fancying the idea of celebrating a „third half-time“, some Gladbacher try to establish friendships with the fans of Thüringen – we don’t mind that. However, they should in turn leave those Borussia fans alone who feel attracted by the Mainz team. We personally know some of the guys from Jena and Weimar very well and maintain a good contact with them thanks to common international matches and the European Cup. But extending these relations to the whole scene? 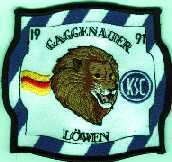 Beside the official friendships of the Borussia fans, we should also mention our excellent contacts with the SC fanclub of Karlsruhe Gaggenauer Löwen. We met the Karlsruher on the occasion of the EURO 92 in Sweden and have been friends with them since then. This friendship was strengthened by our mutual visits, common tours to international matches and last but not least the settting-up of a team at the „tournament of the die-hard drinkers“ in Raststatt that was carried out by the fanclub of Karlsruhe. Nobody should think now that the „Polcher are eager to set up a fan friendship with the guys from Karlsruhe“. This is not true, despite the fact that we have also met some other fans and clubs from the Karlsruhe scene and not only the Gaggenauers. Due to the incidents that occurred in the past , when fans of Karlsruhe threw a lighter at the Gladbacher player „Hochstätter“ and the fans of Gladbach in turn threw a chestnut at „Kahn“, the goalkeeper of Karlsruhe, it is highly unlikely that we’ll become bosom friends some day. But despite all this: Gaggenau & Polch forever!!! This translation was sponsored by A-B-C World Wide Translations.